Victorian period architecture was eclectic, romantic, and often whimsical, and many architects of the time took a design approach that was essentially "mix and match." By the turn of the century, however, a return to classicism was underway. Inspired by the great public buildings of ancient Rome, courthouse architects sought to create similar symbols of civic order and prosperity in this country. 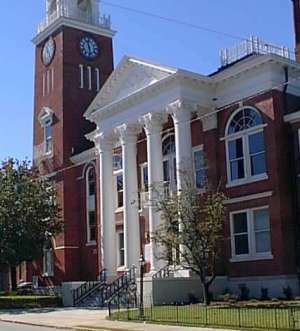 Decatur County's courthouse, built in 1902, represents the transition between the two ideals with its Neoclassical Revival portico and ornament and its Victorian asymmetry. The building is currently undergoing renovation. It stands on a corner facing the town square which was the site of an earlier courthouse, the county's third. It is not known where the two previous courthouses stood. Go east seven blocks and turn left on West Street. on the northwest corner of the town square.